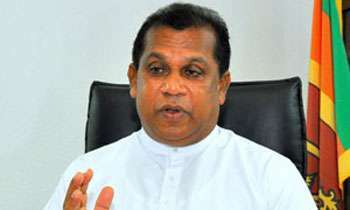 After a fact finding mission in Jaffna, Law and Order Minister Ranjith Madduma Bandara said yesterday the ‘Ava’ criminal gang was a phenomenon created by some youngsters influenced by violent scenes in Tamil films. He told Daily Mirror from Jaffna that these Tamil youths were emulating the violent scenes to instill fear before carrying out their criminal activities such as robberies. "They brandish swords to terrorize the people," the minister said and confirmed that the senior police officers based in the area had briefed him about the ground situation. "It is not as bad as it is portrayed by the media and by political opponents," the minister said. He said the police seized as many as 3,000 kilos of Kerala ganja smuggled into the country last year in the north.